It’s been a busy busy week, and I’m adjusting to the new activity levels. 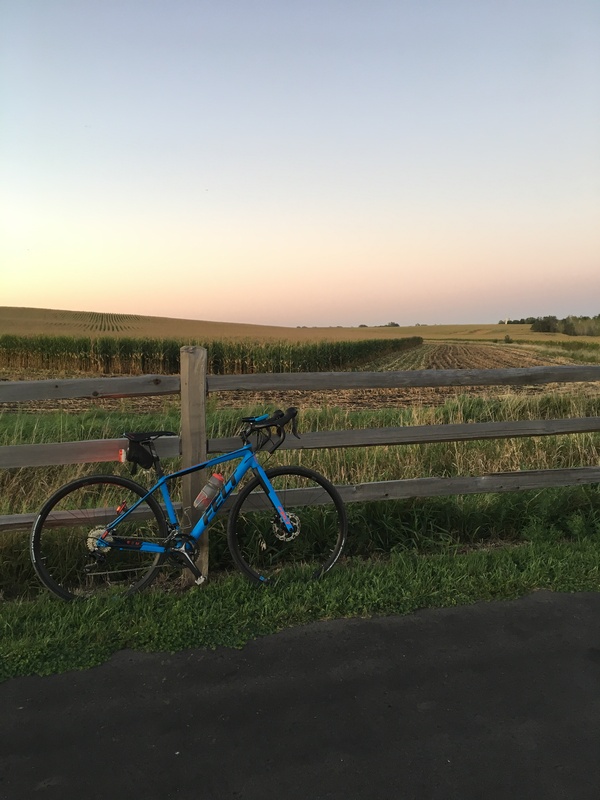 I worked my first full week in the office since perhaps May, I brought home a new bike, and I went on two group rides. I had been anxiously awaiting the arrival of my new Felt “Variable Road” bike for two weeks. This was the bike that Felt recommended I get to replace the V85 I returned to its rightful owner, the closest thing in their current line to what I had grown to love. The bike is designed to be upright and to dampen road vibrations, plus it has disc brakes and clearance for slightly larger tires than your average road bike. The bike came in Tuesday and she’s absolutely gorgeous. Bright matte blue (apparently my favorite color as evidenced by how many other items I possess in the same shade!) with a few spunky red accents. I’ve nicknamed her “Blue” and we are absolutely obsessed with each other. Blue was built on a Wednesday while I was at work; I nicely asked my boyfriend if he’d use his day off from wrenching on bikes to wrench on my new bike. I came home from work and the bike was ready for a few inaugural laps around the neighborhood to get the fit dialed. Things seemed good, so we pedaled off to the Wednesday night gravel group ride. I had never been, but rumor has it the ride is pretty fast especially towards the end. We arrived at the ride and I told more than a few people that I was “just there to get dropped” as I don’t have the ability to ride hard outdoors yet. A few of the guys tried telling me I’d be fine, they were getting dropped too, etc. so I told them tidbits of my backstory (pun intended) and they seemed to get the gist. A few of the guys were skeptical of the skinny tires I was running, and had I ridden gravel before?, and whoa those tires look fast. Right now I have slick 28s on the Felt, and it handled freshly graded gravel beautifully. So far, so good, although I may put something wider on later. My body behaved well on the ride; however, I woke up with a numb and painful left leg on Thursday morning. I can’t figure out if I slept in a bad position or if it was caused by delayed swelling pinching the nerve artery. When I last saw my surgeon a week and a half ago he was VERY clear that if my leg starts going numb or experiencing nerve pain I have pushed too far. I’m trying to be diligent but damn it’s difficult. I knew going back to work would really challenge my system and force me to not focus solely on recovery, but knowing that challenges are looming ahead of time doesn’t necessarily make the struggle any easier. I took it easy for a few days and decided I would join my beloved Saturday morning road ride. The group was headed to Cannon Falls, and if you’ve been paying attention you know my most favorite bakery in the world is there. I’m a sucker for donuts, so this seemed like the perfect first group ride to attempt to finish in its entirety. Most of the guys know I’ve had surgery, so I thought I could stay protected and in the draft and hang on until I was rewarded with donuts. 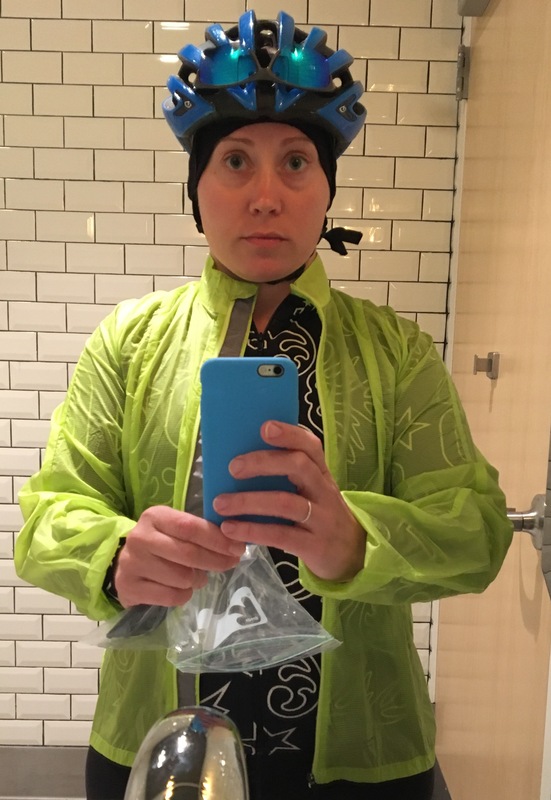 Terrified pre-ride bathroom selfie. My stomach was churning with nerves at the start of the Saturday group ride! We met the group, chatted and caught up with people I hadn’t seen all summer, and rolled out. Even with my obscenely upright (aka “aero AF”) riding position I was able to hide well in the group due to my short stature and didn’t have to work too hard except on a few hills. The sun was shining brilliantly and the cold, mid-40s temperatures felt ok. I was OUTDOORS, ON A BIKE, and the pack was rolling along just over 20 mph. What’s not to love? Someone flatted and I decided I would soft pedal forward on the route to get a few hills behind me. Once I was alone, I was able to do a better job of system diagnostics since I wasn’t using most of my brainpower to draft. (I don’t have vertigo or dizziness like I did close to surgery, but my spacial awareness still needs work.) I reviewed my body, my fueling, my hydration, and how I felt. “Interesting,” I thought, “my left big toe feels a little tingly. Hmmmm. Well, it’s cold outside, maybe I’m just cold? Yeah, I’m just cold.” I took a few more pedal strokes and forced myself to confront the fact that my right toe had zero problems, zero numbness, and no cold sensations. Ugggggh. The downward spiral had started. My legs felt amazing, my lungs felt amazing, my back felt great at the surgical site, the temperatures outside were perfect … and my nerve damage was holding me back. I rode on alone still, waffling between my options. Do I ride back to the car now? Do I ride to the house? Do I finish the ride? I mean, I feel great. And DONUTS. Oh, maybe I can ride to Cannon, eat donuts, and then hang out at a restaurant and wait for sag wagon pick-up? I knew deep down what I had to do. When the group rolled up, I got the car keys from my boyfriend and told him that my leg was rapidly going numb and I was biking back to the car. I told him to keep going with the pack and I’d see him at home later. The group rolled off into the distance and I reluctantly turned around. I struggled with thoughts of failure and felt like a “quitter”. The numbness, tingling, and pain in my leg, which had spread from my big toe up the back of my leg and into my hamstring, wasn’t THAT bad. Pre-surgery, I had ridden through this sensation for hours on end without really realizing it. I have no issues with pushing myself through pain and ignoring angry body parts, and lately being cautious is harder than being tenacious. I rolled back to the car, bolstered by the tailwind. I decided I didn’t want to exactly retrace my path back so I took other routes, wanting to see more of the countryside on this beautiful day. Things were going swimmingly until I approached a major highway crossing — it turns out, the county is systematically eliminating the highway crossings, and the median was blocked by a bunch of concrete barricades. I debated vaulting the barricade with my bike but immediately decided that was a bad idea. I pulled out my phone, dreading how far back I’d have to retrace my route, adding even more forbidden miles to a ride that had already gone south. The next pavement connector that would put me back on a northward trajectory was miles behind me, but I noted that there was a nice north-south gravel road that would expedite my return to the car. I smiled, thankful to be on Blue, the little bicycle with the upright bars, cushy tires, and geometry ready to tackle whatever. Gravel wasn’t a problem, and as an added bonus the scenery was even more enjoyable on the back roads. I’m home now and my leg is still numb and painful, but it’s tolerable. There’s not much I can do to settle it back down other than take it easy for a day and wait it out. Going back to work was more stress than I realized, so I’m coming to grips with the fact that I may have to temper my biking as my body adjusts. Forward progress still exists, just not as fast as this impatient girl would like and with occasional setbacks that keep me in line. For my next blog I’ll cover how I mentally handle setbacks and my process for continuing to push myself forward. If you have specific questions please send them my way! Hi Melissa! I find it interesting that we had our spinal fusion surgeries in June 2017 and both are cyclists. The significant difference seems to be our age and I have been biking seriously since 1978. Even though I do not compete anymore, I, like you, are trying to get back some of my endurance and speed. We also have remarkably some of the same left leg nerve pain issues. I am enjoying reading through your blog and feeling like I am not alone in experiencing this pain that keeps occurring everytime I push it a little. I’m curious, what sorts of pain crops up when you push it? Is it the numb / shooting pain sensation similar to mine? I’m on such a rollercoaster these days, some days are phenomenal and others are crap. I had to go on an emergency work trip to Chicago and I limped off the plane because my leg went numb on the 1 hour flight!